The story of the new Alpine (pronounced “al-peen”) A110 didn’t start when the brand was revived a few years ago (2012, to be exact).It began in 1962 when the A110 Berlinette, arguably the most beautiful model in Alpine’s relatively brief history, was introduced. 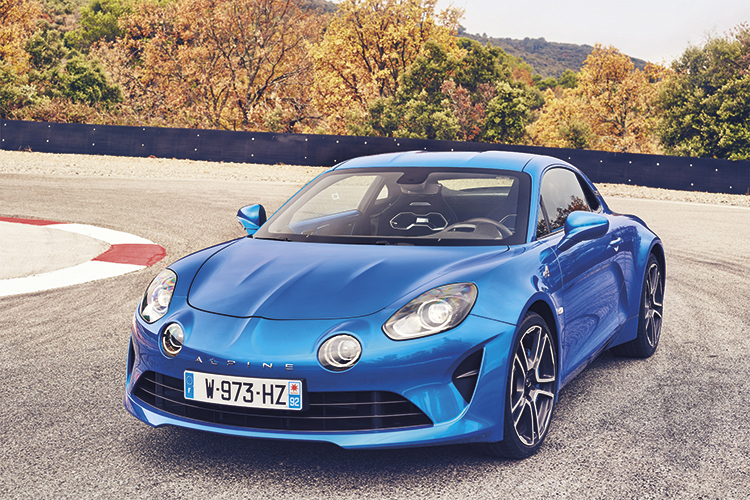 The engineers and designers at today’s Alpine applied the original A110’s principles of compactness, light weight and unadulterated driving pleasure to the new model. However, to answer all sceptics who assume that this is a typical retro-to-modern marketing exercise, the latest A110 was designed and then made from the ground up by a passionate team of in the (Renault-owned) brand’s original Dieppe factory. Alpine has really focused on the word “light” with the A110. Thanks to lightweight aluminium construction, the coupe tips the scales at only 1080kg (1103kg for the Premiere Edition tested here). In comparison, the Porsche 718 Cayman, which is regarded by many as the A110’s main competitor, is almost 300kg heavier (1365kg with PDK dual-clutch transmission). Alpine A110’s purposeful cockpit includes a pair of fantastic bucket seats and Alpine Telemetrics for track days. Because of the A110’s relative lightness, there was no need for a huge engine. 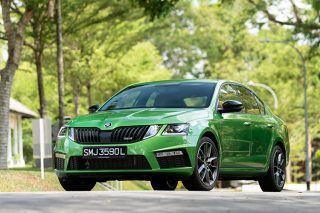 Tasked with propelling the car is a brand new turbocharged 1.8-litre 4-cylinder motor mounted in the middle of the vehicle. Outputs of 252hp and 320Nm are nothing to shout about, by performance-car standards, but in this coupe, they translate to a power-to-weight ratio of almost 230hp per tonne. As a result, the benchmark dash from standstill to 100km/h is dispatched in a mere 4.5 seconds. The car has numerous clever engineering features which keep the weight down. The project’s chief engineer David Twohig set a weight limit which could not be exceeded, and this forced the team to devise innovative solutions. Said solutions include the super-efficient windscreen wiper system (which expels the fluid through the blades instead of through conventional bonnet-mounted nozzles, thus requiring just a small 1.5-litre washer fluid reservoir) and the Brembo brakes (which employ just one set of pads as opposed to the usual two found in most cars with an electronic parking brake). 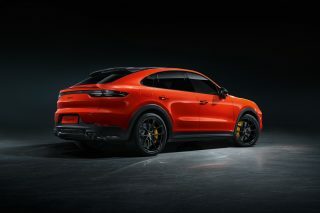 Other weight-saving measures include 18-inch alloy wheels which are forged from aluminium billets, Sabelt bucket seats which are inspired by the ones found in racing cars, and a 7-speed dual-clutch gearbox designed to be as compact as possible. While keeping the kilograms off was the order of the day for the engineering team, making sure that eyeballs were kept on the A110 wherever it went was the goal of the designers, and they have succeeded. This test drive was held in a rather remote region of Marseille, but everyone we met, whether strolling by the walkway or driving alongside, offered a smile or thumbs up, or both! 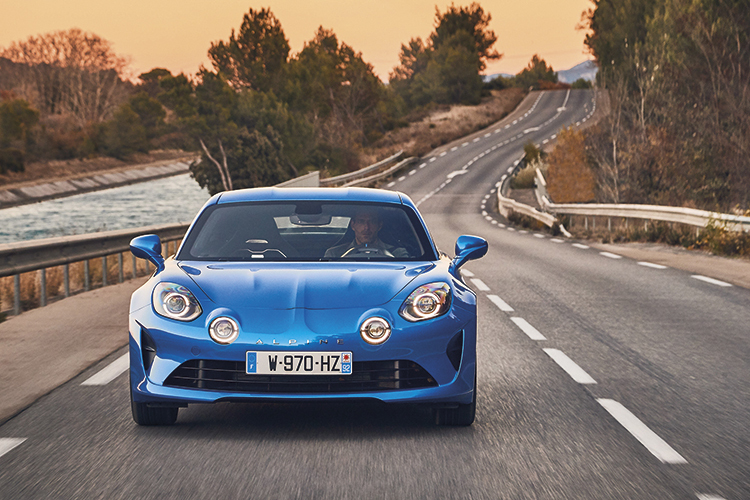 Anthony Villan, Alpine’s design director, has managed to inject signature elements of the classic A110 Berlinette into the new number, yet he has kept it modern. 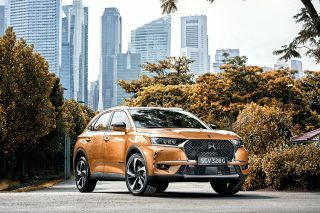 The shape is uncluttered, devoid of any spoilers, and the silhouette slopes gently downward as your eyes trace the car from the cabin to the rear, and you’re taken with the eye-catching double-bubble roof and flat underfloor. Then there are those unmistakably retro quad headlights and the “spine” that “splits” the bonnet into two halves. 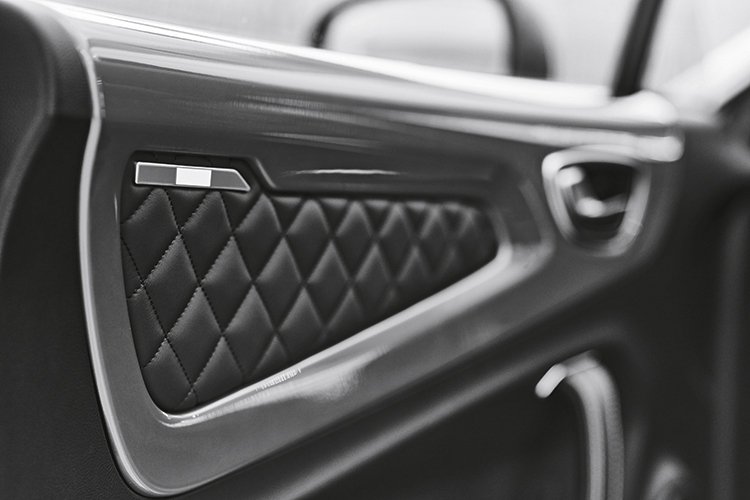 Inside, the celebration continues with diamond-patterned leather trim, French flags and the original Alpine logo proudly emblazoned on the steering wheel’s centre. Depress the large, red start button in the raised centre console and the engine roars into life with a surprisingly potent bark. There isn’t a gearlever. Instead, two tall aluminium paddle shifters positioned behind the steering wheel take care of gear selection, while three buttons on the centre console enable the driver to switch between neutral, drive and reverse. To “park”, hold down the neutral button for a moment. Do the same with the drive button to put the gearbox into its manual shifting mode. The most exciting button of them all is the small, red one marked “Sport” on the steering wheel. Thumb it and four things are altered: throttle response, gearchange speed, electronic stability programme setting, and exhaust note. A single, short press activates “Sport” mode and a longer press activates the A110’s “Track” mode. 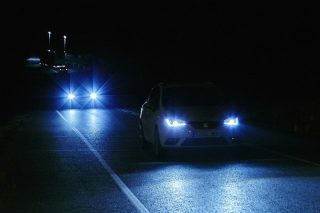 Part of our test drive involves a journey to a private race circuit. The route comprises B-roads with a variety of off-camber turns, tight corners and fast, swoopy bends. 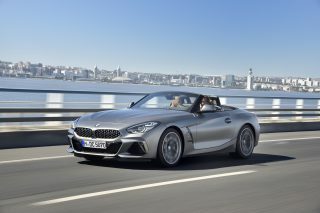 The coupe feels composed throughout, gripping the asphalt like a leech on skin. There are no fanciful electronically adjustable suspension or limited-slip differential. Just an extremely well-sorted chassis and double-wishbone suspension that will happily tackle all kinds of asphalt, while soaking up bumps and surface imperfections with exceptional poise. 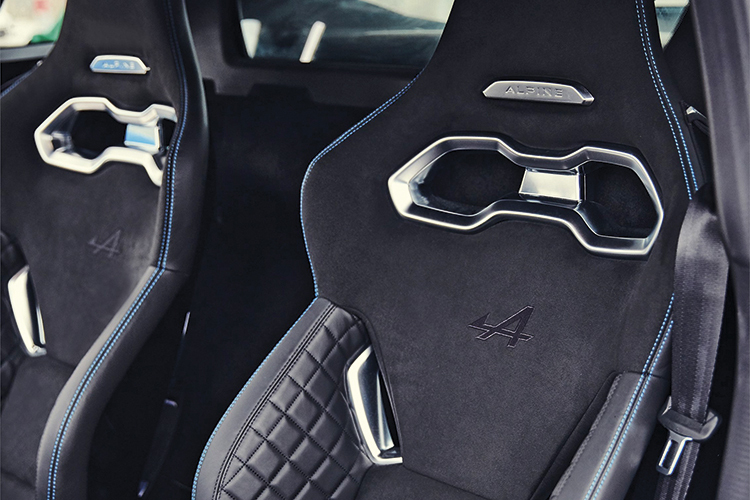 The steering is also incredibly communicative, providing feedback that is as pure as it comes. 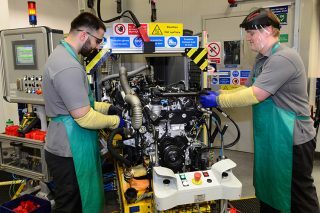 The engine has been deliberately placed in the middle of the car and the 45-litre fuel tank is behind the front axle, resulting in a 44:56 weight distribution. This endows the A110 with a balance that few cars can match. My positive impressions are further reinforced after 10 laps around the 2km Grand Sambuc circuit. The A110’s “Track” mode is brutal, but in a hugely satisfying way. The gearchanges in this mode are borderline visceral and every upshift is accompanied by an obvious thump. Hold the “down” paddle long enough and the gearbox skips a couple of cogs for lightning-fast in-gear acceleration. Great when braking late for a corner after a high-speed run! Driving around the track in the A110’s “Sport” mode is just as satisfying, even with the gearbox in automatic mode. There isn’t any gear-hunting while in mid-corner, and the sound coming from the single-exit exhaust system is simply sonorous. “Sport” is also the best choice for day-to-day driving in the Alpine. Do not think for a second that the A110 sacrifices creature comforts for sportiness. It might be only 4.2 metres long, but it accommodates two tall adults easily. Standard equipment includes a multimedia system with a 7-inch touchscreen, navigation, Bluetooth, climate control with particle filter, and a high-quality, four-speaker Focal audio system. Alpine A110 is composed, sonorous, beautifully balanced and fast, clocking 4.5 seconds in the century sprint. Aluminium pedals are also fitted as standard, along with an aluminium footrest in the passenger’s footwell. The rather odd item reminds me of a rally car. Is this a hint of an upcoming Alpine venture into motorsport? There isn’t much storage space, but two “boots” – one in front (96 litres) and another at the rear (100 litres) – provide as much stowage as any compact sports car. 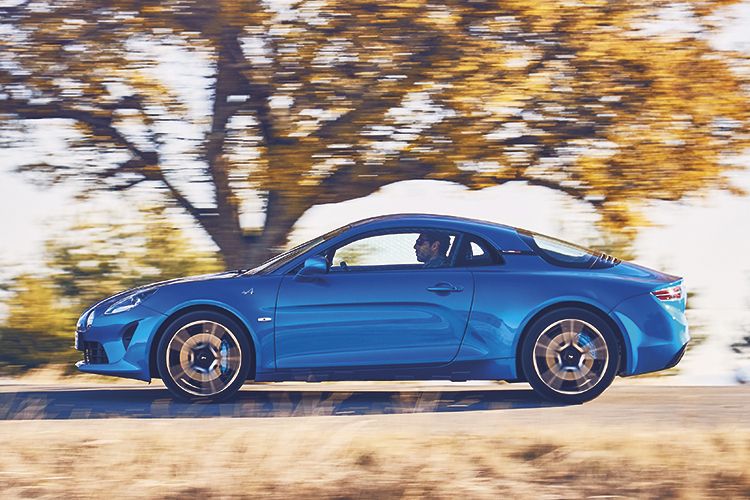 Alpine has truly outdone itself with the A110 as the brand’s relaunch model. In a highly competitive category, arguably headed by the Porsche 718 Cayman and sporting (pun intended) serious contenders such as the Audi TT, Alfa 4C and Jaguar F-Type, the new-age A110 still stands out. The original A110’s principles of compactness, light weight and unadulterated driving pleasure have been applied to the new model. 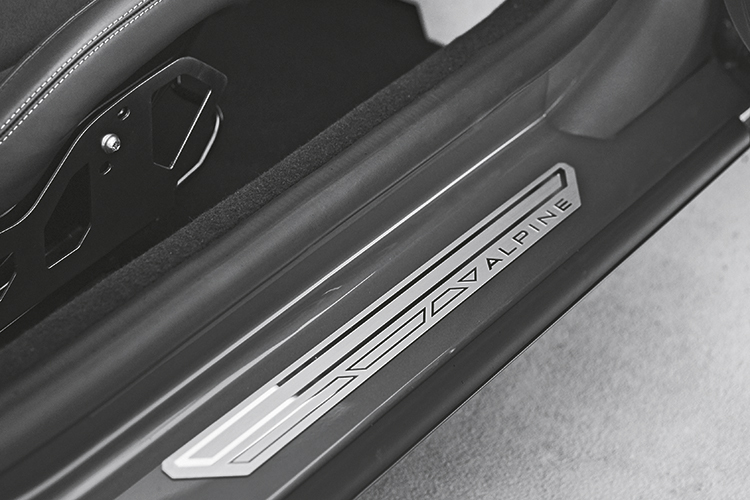 Alpine has managed to cram the best of several talented rides into one bantam package. 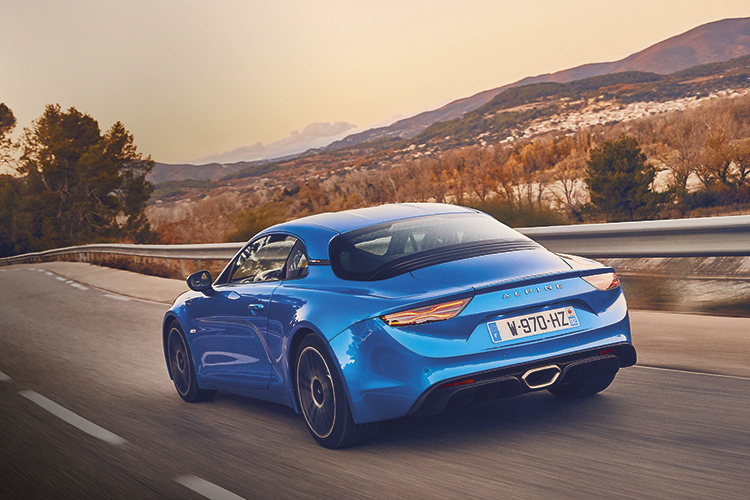 If you’re in the market for a European sports coupe with the purest of performance plus daily driveability, and you don’t have one iota of badge snobbery, the Alpine A110 won’t disappoint.